Ren'ai Harem Game Shuuryou no Oshirase ga kuru Koro ni (恋愛ハーレムゲーム終了のお知らせがくる頃に, When the End of the Harem Love Game is Announced?) 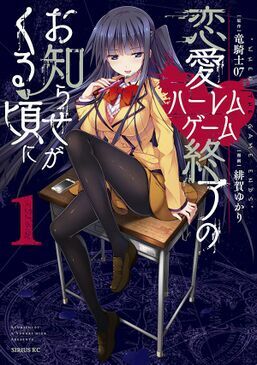 is a horror harem manga series written by Ryukishi07 and illustrated by Yukari Higa. When the Game Ends follows a group of schoolgirls who are roped into a game by a supernatural being named Zepfur. The objective of the game is to win the heart of Kohinata Asunaro, and the consequence of losing is eternal damnation. Each girl receives an app on their phone that documents the "hearts" they have achieved. Each girl begins the game with two hearts. If a girl manages to get seven hearts then she wins the game while falling to zero hearts means she loses the game. A nondescript second year high school student and the focus of the harem game. Each girl in the game must attempt to win his heart or else face death. A supernatural being indebted to Asunaro. Zepfur is responsible for the creation of the harem game that the other characters play. Zepfur's name seems to be an amalgamation of two supernatural characters from Umineko no Naku Koro ni: Zepar and Furfur. This page was last edited on 1 August 2017, at 20:28.